The apostles all “joined in continuous prayer, together with several women, including Mary, the Mother of Jesus” (Acts 1:14). 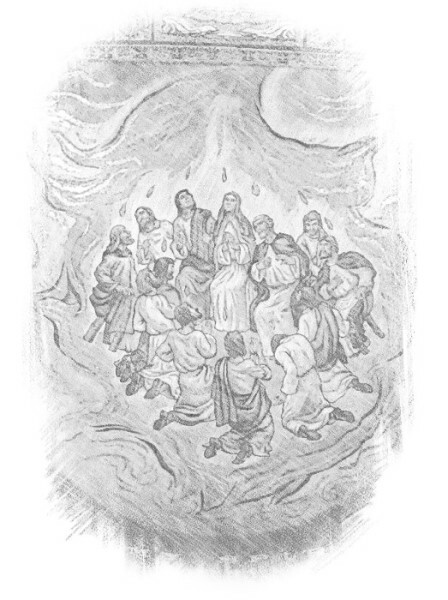 “On the Day of Pentecost they were all together in one place” (Acts 2:1). “And suddenly a sound came from heaven like the rush of a mighty wind, and it filled all the house where they were sitting. And there appeared to them tongues of fire, distributed and resting on each one of them. And they were all filled with the Holy Spirit and began to speak in other tongues, as the Spirit gave them utterance” (Acts 2:2). Lord Jesus, you gathered your apostles with your Mother, Mary, and you filled them with the Holy Spirit. Send forth your Spirit upon us and renew in us the graces of the Sacraments of Baptism and Confirmation. Ignite us, Lord, with an ever-greater passion and love for the Gospel, which will enliven our Christian witness and rebuild your Church in the United States of America. Amen. We pray for the intentions of bishops, priests, religious men and women, consecrated men and women and hermits, that the power of the Holy Spirit will continually renew them and empower them for ever-greater works in the vineyard of the Lord.